At TwoNav we know how you love experiencing new adventures, trying out new challenges and doing extreme sports that defy your senses. Having the right gear for these outings is essential so you can avoid unnecessary risks while doing any outdoor activity. Just like you protect yourself both while doing an activity and then when you get home, it’s also vital to take care of your gear, including the GPS unit so you can stretch its useful life to the maximum. In our catalogue you’ll currently find two different models with the same finishes but in two sizes to snugly fit your device so it can absorb most of the shock in the event of an impact. 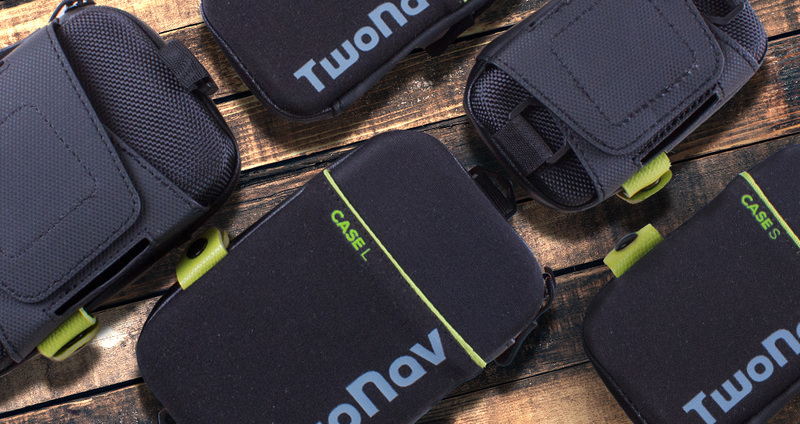 It’s the familiar Case S and the new, larger Case L.
The Case S is specifically sized for the Sportiva (Sportiva, Sportiva+, Sportiva 2, Sportiva2 +) and Anima (Anima y Anima+) range of devices. 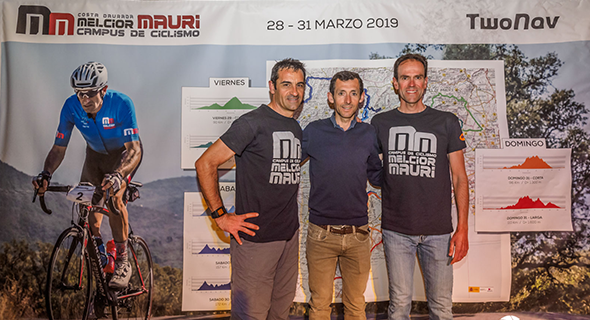 Thanks to its design the GPS unit will be perfectly protected during the most extreme activities. It’s made of rigid materials and features a design with internal compartments and a D-ring. You can attach it to a belt, rucksack, your shoulder or even your waist. 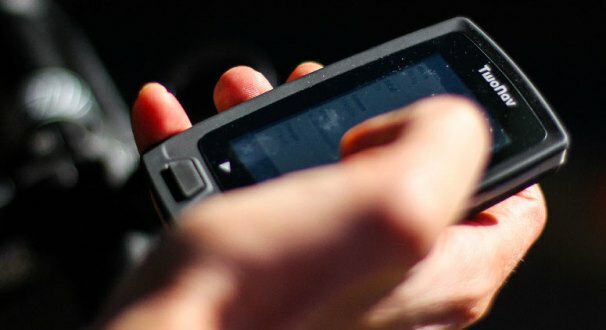 Even if it rains or if you hit the GPS unit, this case will keep it safe. The Case L is larger than the Case S and is specifically designed to fit the Aventura family of devices. Equally resistant to water and impacts as the S model, it maintains the exclusive TwoNav design adapting perfectly to the shape of the Aventura GPS units. It also has compartments where you can store a spare battery or other accessories. You’ll be able to carry the device on your belt or rucksack, or hang the case from your shoulder or your waist and have it always protected. To find out more about other useful TwoNav accessories visit our website and learn how to get the most from your GPS device. Are you thinking of getting away for a few days this Easter to unwind? New TomTom Maps now available! Then we have some great news for you: We’ve updated our TomTom maps! Then get the latest version of TomTom’s road maps now. In addition, those users who have purchased TomTom maps between 03/03/2017 and 04/03/2017 will be entitled to upgrade to the new version, for free. 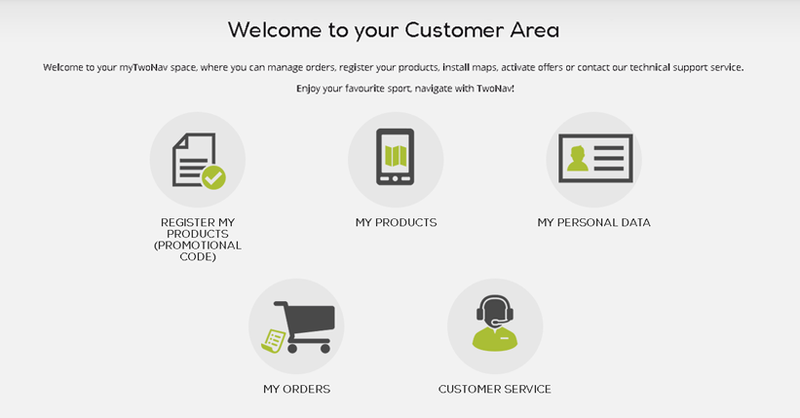 Just contact our Customer Service department at http://support.twonav.com/ and open a service ticket, explaining that you bought a TomTom map last month. 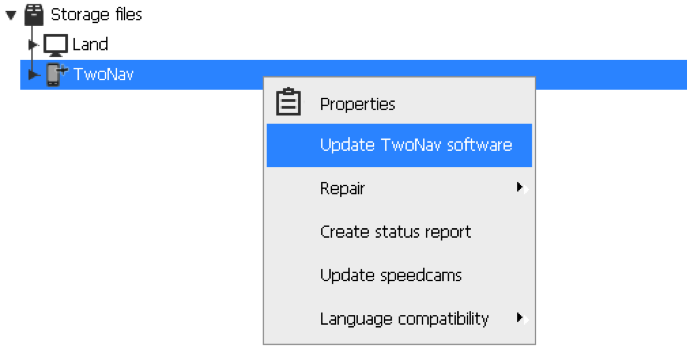 Did you know that… TwoNav features several tools in the Pin mode? This week, on a new instalment of “Did you know that”, we show you how to use TwoNav’s pin mode. Though it generally goes unnoticed, it has a lot of potential, as we’ll show you now. What is TwoNav’s ‘Pin’ Mode? Pin mode is a powerful tool that lets you use very useful information to analyze your surroundings. To activate the pin mode, click and hold on a point on the map. The selected position will be marked on the map with a pin, and a window will open on top showing information on that point (TwoNav will shift from ‘Data’ mode to ‘Pin’ mode). What information can I see in ‘Pin’ mode? Bearing from your current position to the point selected. Name of the element selected (if you clicked on a waypoint, track, route, street, POI, etc.). Coordinates of the point (if no element is selected). Distance from your current position to the point selected. To see more information, you can add more fields from ‘Main menu > Settings > Full settings > Map page > Pin mode’. What can I do inside ‘Pin’ mode? 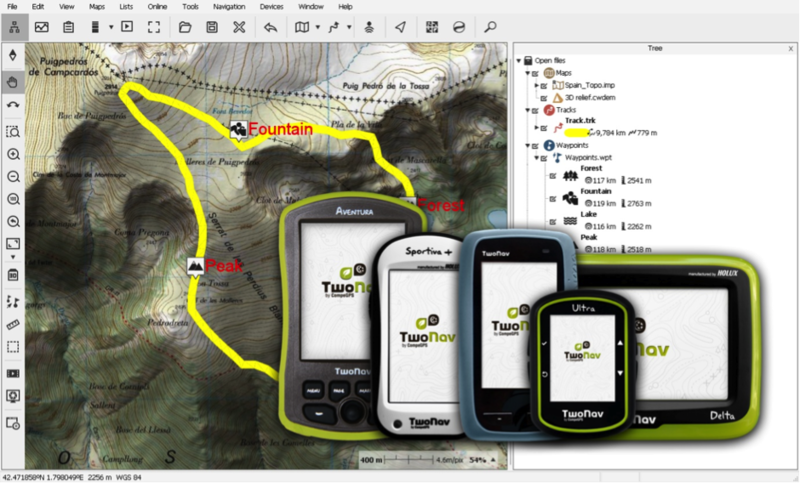 Create an element on the selected point: Waypoint, track or route. For waypoints: Change the waypoint icon, move the waypoint to a new location, etc. For routes: Change the icons of the waypoints that make up the route, edit the route layout, add more waypoints to the route, reverse the route direction, show a graph with altitudes on the route, and more. For tracks: Edit the track layout, divide the track into laps, show a graph with altitudes on the track, play back a simulation of the track, etc. 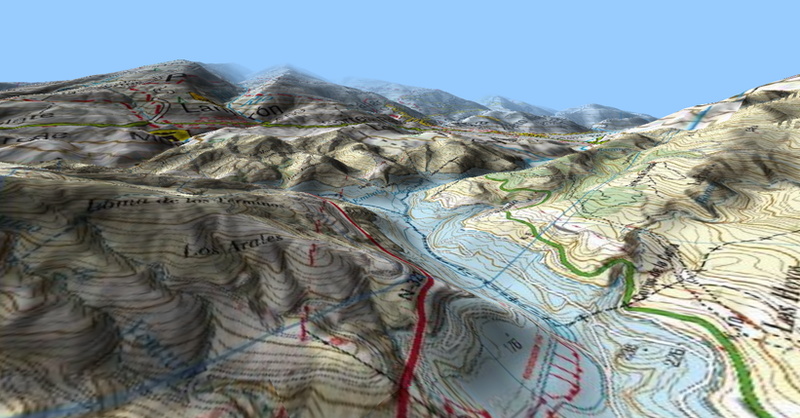 For maps: See the map’s properties, show the map’s contour, arrange maps into several layers, etc. Anchor your selected position: Replace your current position by marking another position on the map. Once set, the information shown in the distance fields will be based on the new, anchored position, not your actual position. Also, if you hit ‘Re-center’, TwoNav will re-center on the anchored reference point instead of your current position. Navigate to the selected point: The navigation will start from the current position to the point selected (waypoint, track or route). Remember that once you mark a location on the map, you can change the position of the pin by clicking elsewhere on the map. The information shown in ‘Pin’ mode will be updated based on the location you mark. To close the ‘Pin’ mode, press the ‘Back’ button on the top bar. Connect to catch up on the latest. Welcome to TwoNav New in. TwoNav New in : We have great things in store for 2017 lots of changes and innovations. That’s why we’ve created “TwoNav New in”, a new blog section where you’ll be able to stay up to date on the latest developments involving our products. This section will detail what we’re working on at all times. You’ll find information on future launches, new features, and advice for getting the most from every one of your outings.. Enjoy this new section intended exclusively for TwoNav followers, ñwhere you can interact, share opinions, ask questions and more. It’s basically an area where you can feel like you’re part of our family. Plus, if all the articles and the new community aren’t enough, you can also follow us on Facebook, Twitter and Instagram, or subscribe to our newsletter.